As photographers, we heavily rely on computers to store, edit, backup and export our work. While it is nice to be able to work from home or from our offices, many of us have to count on using more portable solutions in the field. 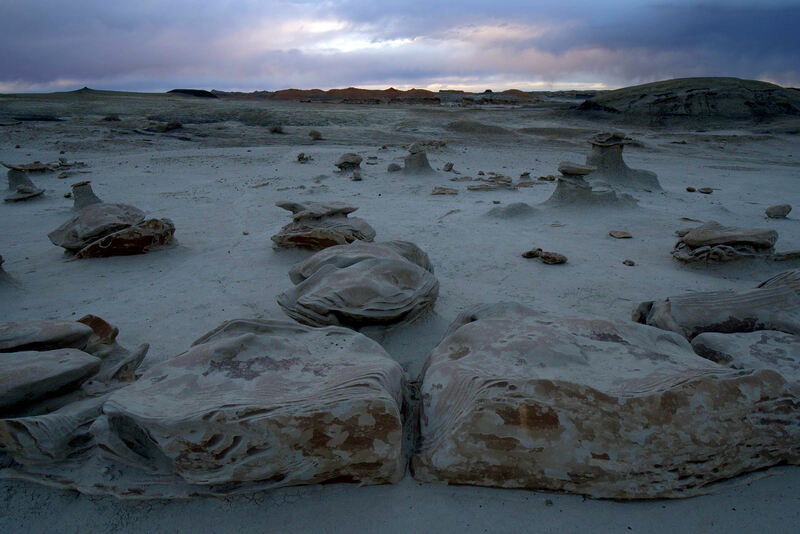 As a result, those of us who frequently travel to remote locations often end up using portable laptops. However, laptops are large, heavy, fragile and they require power to work for more than a few hours. What if one could replace a laptop with a smaller, lighter, water-resistant and shockproof device that is designed to be able to edit content on the go? That’s where Gnarbox comes into play. Initially funded by a very successful Kickstarter campaign, Gnarbox is essentially designed to replace a laptop. This means that the device is equipped with its own mini-computer, storage, memory card slots, RAM and enough ports to be able to charge the device and transfer data. It is a relatively small and lightweight device that measures 5.3 x 3.4 x 1″ (13.5 x 8.6 x 2.5 cm) and weighs just 1 lb (0.5 kg). It features Intel’s 1.92GHz Quad Core CPU, has 2 GB of RAM and provides two memory card slots (SD and microSD). For external media connections (to be able to connect CF, CFast or XQD memory cards via an external memory card reader) and for connecting additional storage, two USB ports are provided (1x USB 3.0 and 1x USB 2.0). Speaking of storage, the cheaper Gnarbox configuration sports a total of 128 GB of flash storage, but there is also a 256 GB model for those who need more built-in storage. Gnarbox is powered by a built-in rechargeable battery and it is supposed to last 4-6 hours depending on how the unit is used. The nice thing about Gnarbox, is that one can charge it with a Micro USB cord, so it is possible to recharge the unit with either an external battery pack, or by connecting it to a standard USB wall outlet that often comes with your phone. While the Gnarbox does not have a built-in LCD display, it is designed to be used along with a phone or a tablet that runs either iOS or Android operating systems. As you can see, the Gnarbox looks great on paper. But how does it hold up in the field? I had a chance to use the Gnarbox for a few weeks and I have some both positive and negative feedback to share on it. Charging the Gnarbox is pretty easy. There is only one micro USB cable provided with the unit, so you simply plug one end into the micro USB end on the device, while plugging the other end into any USB Type A port. This means that you can charge the Gnarbox with pretty much any power source – whether it is the USB port of your laptop, a solar panel, or even an external battery pack. The more powerful the charging source, the faster it can charge the Gnarbox. Ideally, you should provide at least 1 AMP of power. During charging, the second LED indicator will turn blue and will stay blue until the unit is fully charged. Once full, the blue LED light will blink. While it is helpful to have the two LED lights, I personally would prefer some other way of providing information to the end user. Perhaps a small, low-power LCD screen would have been more helpful. Otherwise, you will have to refer to the provided “LED Indicator Meanings” table in the manual, or the manual within the app to see what’s going on with the unit. It is important to note that per Gnarbox “Best Practices” document, one should not attempt to transfer any files or connect external hard drives while the unit is charging. So I would recommend to charge the unit before doing anything serious on it! 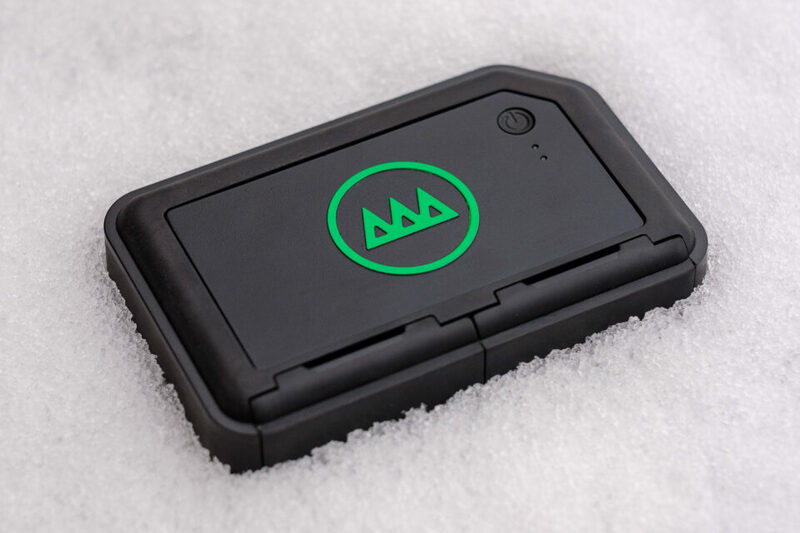 The Gnarbox is designed to be easy to use, with its minimal interface and buttons. In fact, the unit literally has one button that is used for powering on, powering off and resetting the device, and as I have already indicated, there are two LED status lights. To power on the unit, you push the power on / off button and hold it for one second. The first LED light will blink yellow and red and after 35 seconds or so, the unit should be fully powered up, with the first LED light staying green. At this point, the unit is ready to receive external connections over WiFi. All you have to do is fire up the Gnarbox app (available for both iOS and Android platforms) and start the connection. Let’s go over the app in detail. Gnarbox is designed to be used and abused in the field. As I have already pointed out earlier, the device is nicely weather-sealed to withstand tough weather conditions. I tried submerging it into shallow water and the rubber seals that protect the ports worked very nicely, protecting anything from getting in. This means that the unit should be able to stay protected from the elements when traveling, even at high levels of humidity. Obviously, once the port doors are open, the unit is no longer protected, so I would discourage using the device with any external cables plugged into the unit, since water could still get through. I only have a very slight complaint – because the doors are tightly sealed, it takes a bit of effort to get them to open. I almost broke a nail while trying to prop one of the doors open. After that, I used a coin or my car keys to open it up. Not a huge deal, especially considering how well the ports are protected, but definitely worth pointing out. That’s understandable, since the camera is very new and RAW support will probably arrive later on. 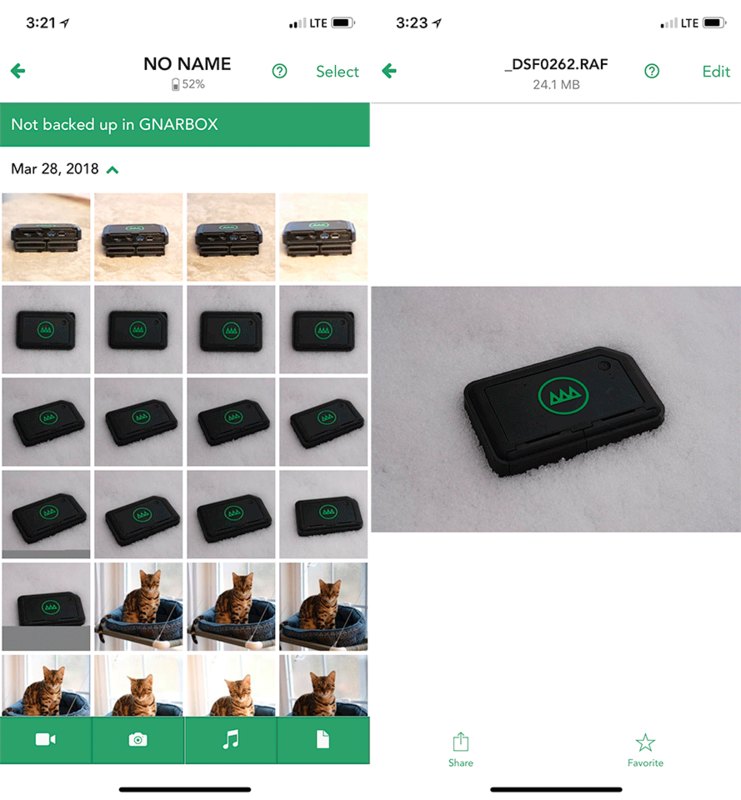 When I initially saw the thumbnails, I knew that Gnarbox was reading the embedded JPEG images within the RAW file and if the software was able to actually allow me to edit the RAW file, it would most likely mean that only embedded JPEG images were being processed. The fact that the RAW file did not load means that Gnarbox is actually using a real RAW converter to work with the RAW data, which is nice. In addition, you can change orientation and perform basic cropping, although it is impossible to adjust tilting from the software. First of all, the software down-sampled the original resolution from 6000×4000 to 4096×2736 pixels. Second, despite my attempts to keep highlights preserved, I clearly could not make an image that was bright enough in the foreground without blowing out the sky. Third, the resulting image contained a lot of JPEG artifacts, despite having a rather large image size of 6.2 MB. 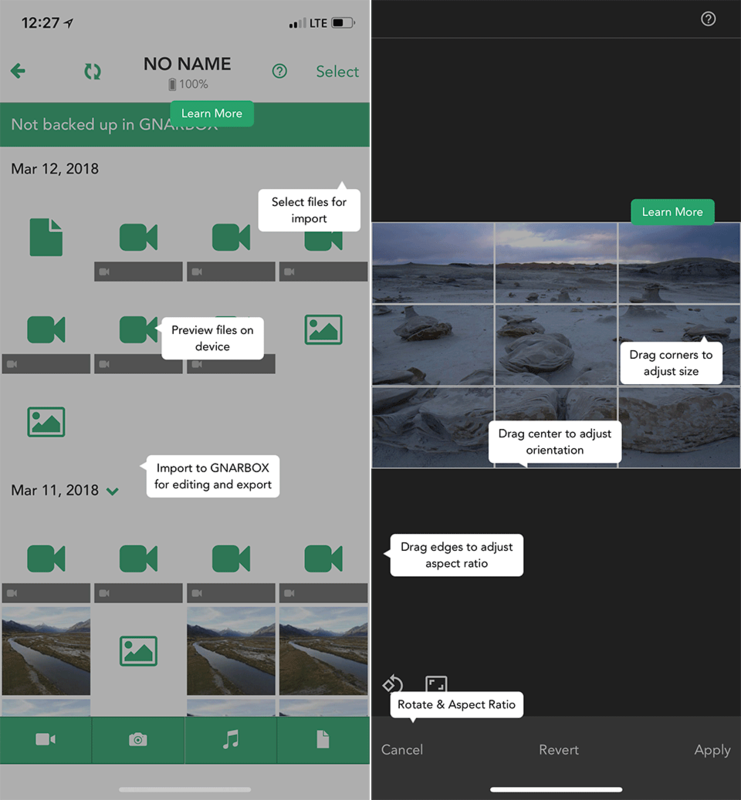 Obviously, it is not fair to compare what one can do in phone software vs full-featured desktop software, but that’s another reason why I personally don’t edit anything on my phone. If I were to edit on an iPad or a laptop, I know that I could get pretty similar results as the above using Lightroom. All this basically means that the image editing capabilities of the software are quite limited. For me, the software is way too basic. In addition, I did not like editing images while looking at a pretty small thumbnail – I wish there was a way to change the orientation of the software to be able to take advantage of more screen space. In fact, the software only works in portrait mode and it has a number of bugs with non-standard resolutions (more on bugs below). One of the most important features of Gnarbox, is the ability to edit video footage all the way to 4K. Having recently traveled to New Zealand, I was able to capture a bunch of footage of different places using the DJI Mavic Air drone, so I thought it would be a good idea to see what I could get out of the Gnarbox when doing editing of 4K footage. Indeed, the process took a while and the playback was very choppy. I realized that it would be much faster if I were to move the contents of the microSD card into the Gnarbox, so I started the copy process before waiting for the rendering job to complete. I am not sure if it was the combination of the rendering process plus copy or something else, but boy, transferring around 40 GB of video footage took quite a bit of time. By the time the copy process was done, the battery level on the Gnarbox was at 56% – far less than the promised 4-6 hours of usage time. I will let you be the judge of the quality. I think the overall footage looks decent, although to be honest, I would only use the Gnarbox to post something quick to social media. I would still prefer to use a computer for proper video editing, where I can fine tune the footage, do proper transitions between clips, position video clips with audio tracks better, etc. 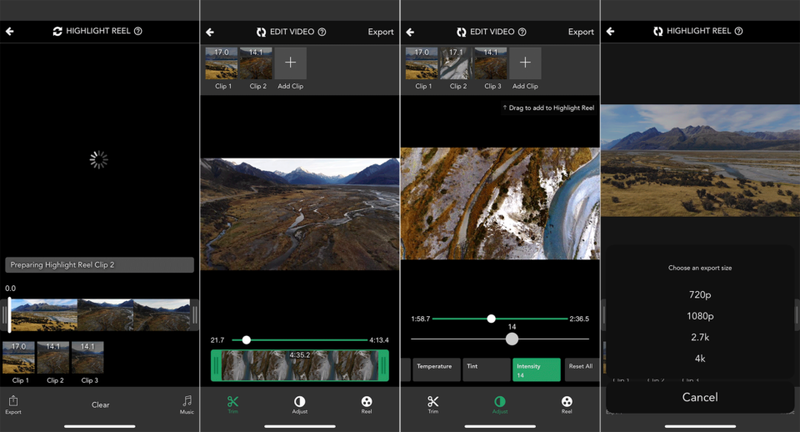 So far, it looks like Gnarbox is a half-baked solution for image and video editing. But what about its use as a backup solution? I wanted to test the Gnarbox in two scenarios: when backing up to the Gnarbox internal storage (which is quite limited, especially on a 128 GB model) and when backing up images to an external hard drive. For the first test, I used a 128 GB SD card (fastest UHS-I card, 95 MB/sec read and write speeds) to transfer approximately 53 GB of RAW images to the Gnarbox (uncompressed RAW files from the Sony A7R III). I started at 64% battery level. The whole process took a total of 45 minutes and 27 seconds, which is abysmal compared to what I could get on a computer with an SD card reader. In fact, I repeated the same test on my computer and copying the files from the same card only took 10 minutes and 55 seconds total – a 4.5x difference in speed! I am not exactly sure what caused such slow transfer speeds, but I cannot imagine waiting for one memory card to take an hour to transfer images – that’s just not practical. And keep in mind, that the 128 GB SD card was not even half full – if I were to attempt transferring 128 GB of data, I would have to wait almost two hours. Let’s also not forget about the battery drain. By the time all files finished copying, my battery level went from 64% to 38% – that’s almost a drop of one third of the charge. This means that if I had three 64 GB memory cards, by the time I was done backing up all the data, it would have pretty much drained the whole battery. For the second test, I used the same SD card to copy the contents to external storage. I attached a fast Samsung Portable SSD drive to the USB 3.0 port and selected the destination. I was really hoping that this time the copy process would be faster, but I was seriously wrong. By the time I reached 25%, it already took over 11 minutes. Simple math calculation showed that even with an external hard drive, I was looking at 45+ minutes of copy time. Lastly, I am not a big fan of the way that the Gnarbox backs up storage media. In order to back up the files, one has to either navigate to the folder structure, pick a folder and start the copy process, or go to thumbnails, select everything and then start the process. Instead of this routine, I would prefer to have a one-click solution, where one is able to select the source (SD, microSD or any other card from a reader) the destination (Gnarbox or external storage) and simply click a “Backup” or “Copy” button to start the backup process. It is nice to have the option to select some files to copy, but for those who need a solid backup solution in the field, I would prefer to see a simpler approach. Either way, it really doesn’t matter how files are backed up – the bigger issue is clearly performance-related. While working with the Gnarbox, I noticed one very noticeable hardware issue, which could potentially impact the life and the performance of the product. When working on transferring files or editing content, I noticed that the area around the Gnarbox logo was so hot that I could barely touch it. My guess is that the main components of the Gnarbox (CPU, RAM, etc) are located right under the logo. I think that because of the weather-sealed nature of the Gnarbox, there is not enough air getting into the chassis to cool down the main components, so there is practically no heat dissipation taking place, resulting in extremely hot temperatures. What’s worse, the hot temperatures also impact inserted media – after the above copy process was complete, my SD card was also pretty warm. Now keep in mind that I was performing my tests in an indoor environment, with temperature staying around 70° F. I cannot imagine what would happen to the unit if I let it copy a memory card at warmer temperatures – it would probably end up melting the chassis and potentially even destroying the data on both the unit itself and the memory card. So if you are planning to use the Gnarbox in the field, keep it cool and try not to subject it to direct sun rays – you might end up damaging it. To me, this is a rather serious hardware issue to be concerned about. From my prior experience working in the IT field, I know that computer hardware just doesn’t last when subjected to very high temperatures. As you can see, none of the pointers match the real menus and icons on the screen. I saw this problem more than a few times and I bet it would look quite confusing for a first time user. 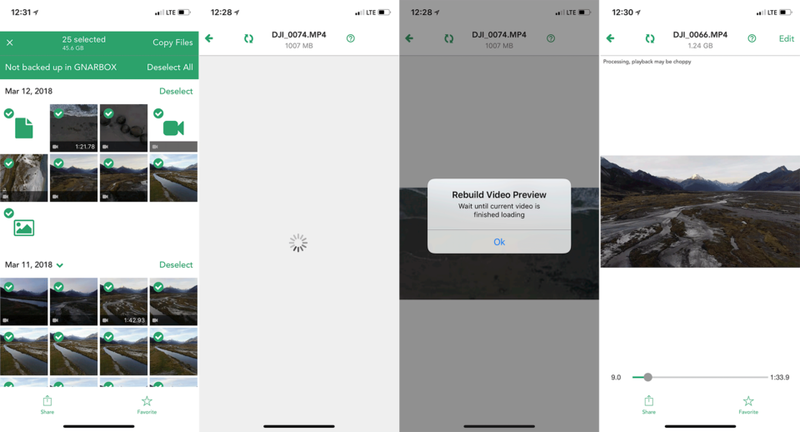 Second, when using the app, if the screen of my iPhone timed out while I was editing an image or a video clip, the software forced me to go back to the card and reopen the image or video before I could edit it again. I found this to be quite annoying. Third, when ejecting media, the software would indicate that the device is still ejecting it (after a long wait), although there was nothing displayed under “Devices”. It would eventually time out, with the “Unable to eject drive” error on the bottom of the screen. I saw this issue more than once, so it seems to be a software / firmware related problem. Lastly, depending on what camera the RAW files came from, previews took a very long time to render. When I tried to look at the thumbnails from the Sony A6500 (RAW files were uncompressed, which could be part of the reason), it took a long time to show even one thumbnail – and I had hundreds of images on the memory card! 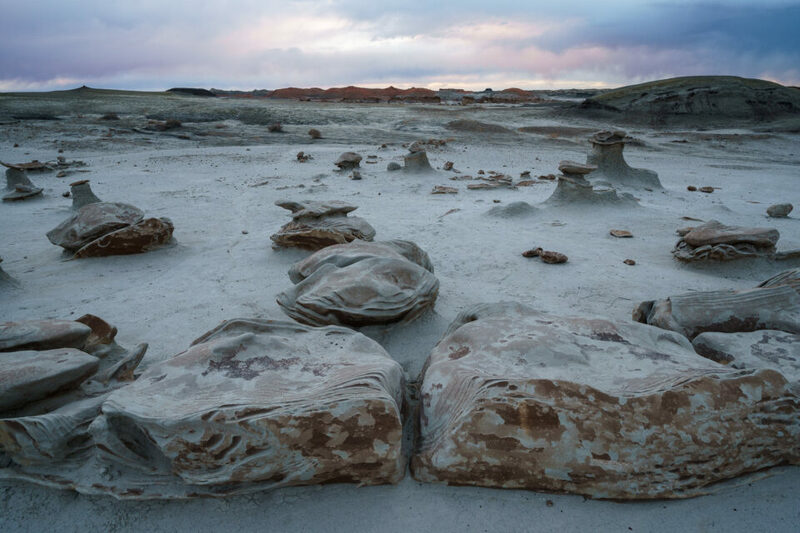 So if I were traveling and I wanted to pick one single image to edit, I would have to sit and wait for the thumbnails to generate. I am not sure what method Gnarbox is using to fetch those thumbnails, but it is not a very efficient one for sure. When Gnarbox was first announced via a Kickstarter campaign, it looked like a really cool gadget for those of us who want to travel light. The idea of leaving a laptop behind, while relying on a small and lightweight box sounded great, which is why I was hoping to test Gnarbox out for my own needs. However, after spending some time with the Gnarbox, I realized that it simply fails to deliver. Its image editing capabilities are very limited when compared to Lightroom mobile, so it is not a great post-processing tool. It does a better job at editing video, but I really don’t see myself relying on a tiny screen of my phone to deliver high-quality content, which basically diminishes the real use of Gnarbox to perhaps posting snapshots of content to social media. It is extremely slow at backing up images when compared to doing the same on a computer. It has both hardware (overheating) and software (stability) issues. In short, it is a “Jack of All Trades, Master of None” type of solution. As always, you can support our efforts by purchasing from our trusted partner B&H Photo Video. If the above issues do not concern you and you still want to purchase the Gnarbox, then you can follow this link for the 128 GB version ($299.99) and this link for the 256 GB version ($399.99). Apart from its attactive rugged waterproof design(I’m looking for) and editing features(which I don’t need), 256GB is too small, too slow and operating time too short. When shooting a marathon I could use up to six 64GB cards across a span of 8 hours. Anyway, while it does not fit my needs, it may fit others. Rany, I fully agree. I am not sure why anyone would buy this – it doesn’t have enough storage, doesn’t allow one to expand the built-in storage, the box overheats like crazy, it is too slow and it is buggy. If the built-in storage is insufficient (which it is), then what’s the use of this thing if I also have to carry an external hard drive / storage? I am better off taking a lightweight laptop that has 1 TB or more of space, and I don’t have to worry about taking other gadgets with me that I need to remember charging. Thanks, Nasim! Very useful info. Was thinking about buying a Gnarbox, but am reconsidering doing so after hearing your experience with testing it. You are most welcome Wendy, glad you found the review to be helpful. I know it’s a lot more hardware to bring and fragile to boot, but a device like a Surface Pro seems much more appropriate for this type of work. My setup is light and powerful compared to a laptop and great for backing up to a 1tb. external SSD. I don’t have the LTE version, so connectivity is an issue without nearby wifi or using your smartphone. Still, it’s fast and Lightroom / Fast Raw Viewer are at your fingertips. Sceptical, I agree – I think most of us creatives would still prefer to take a laptop with us when traveling, since it gives us flexibility and allows us to use the laptop to work as well. And if there is someone who wants a solid backup solution, there are plenty of products on the market, including the WD My Passport-series devices. Thanks for the review. It’s helpful to see what new options are being developed. Though I bring my 15″ MacPro when I can, when going to more remote places, the MacBook Air, along with a trio of portable SSD drives comes along, one for laptop cache (for Bridge/Photoshop) and backup, and the other two for image storage and backup. The SSDs are so fast that anything else I used before that tucked it’s tail and slunk away due to slowness, size, and weight. I have used the Kingston MLWG2 for simple backups from a camera memory card to a USB memory stick. It uses my iPad to control the transfers and view at least thumbnails of the images. No editing capabilities but an inexpensive way to back up your files if you do not want to take a notebook. I see there is now an MLWG3, which may function in a similar fashion. It is US$25, plus the cost of USB memory. Your storage capacity is only limited by the number of memory sticks you purchase. Speed is not going to be great, but you can leave it to transfer files while you go for a meal. The device is also a USB power source and can allow some file sharing. It is not weatherproof. About the size of a smart phone. Thank you for your review of the Gnarbox. Thank you for your feedback John! There are plenty of great options for backing up SD cards in the field, and it looks like your solution is working out well for you. Does your phone need to be active during the transfer from SD to external storage? Can you exit the app during the transfer and do other things or do you need to leave the screen open on the app throughout the process? Very informative review, thanks Nasim. Are you familiar with the MY PASSPORT WIRELESS PRO by Western Digital. They make a SSD model and a regular hard drive. They can hold significantly more data than the Gnarbox. I was a little curious about this option, but the WD site has inconsistent info about the features and lacks key specs like weight, transfer speeds, etc. And it talks about access from a phone, tablet, or computer, but isn’t clear about how any of that is accomplished, nor features comparison by device. In the context of “in the field” I’m not sure more data is a benefit, as that usually means more weight, more power, and often slower speeds, since anything other than SSD is really slow in comparison. And, unless one is shooting video and gone a long time, there just isn’t a practical need for “more data”. In essence if cost is no issue, and space savings is the key, then you shoot with a camera that can shoot to two cards (the second a copy of the first), then retire them, storing them in different places, and load a second pair, and so on. That’s expensive and limiting since one may not have an accurate feel for what one will see and want to capture. I went this route my first trip to Africa, as every pound was limited and space was a premium – especially in the context of the traditional wildlife kit (600mm f/4, 300mm f/2.8, teleconverters, cameras, etc.) I had plenty of camera cards for the trip, but it wasn’t the way to work, for me. I tried a lot of different things since I travel a lot. In the end using the most appropriate laptop, card readers, and three SSD drives has served me very well. The SSDs are barely bigger than a couple of camera cards – they are blazing fast and can hold more than enough images for a two-three week trip, whether domestic or international. I have a graveyard of mobile hard drives that worked (compact and relatively fast, in their day), but all were slow relative to the SSDs. And the reality too, is that there are a lot more pictures I don’t take compared to a decade ago – and that helps make the space work for me. Mark, I will be reviewing this device next – hope it will answer some of your questions and concerns. Stephen, that’s exactly what I am reviewing next – WD My Passport Wireless SSD (their newest model). It is a great option and something I would prefer any day over the Gnarbox. I was able to copy the same 53 GB of data over 14 minutes and this thing has up to 2 TB of storage. On the negative side, it is a bit bulky and heavy, and has other problems (will go through those in the review). Still, if someone wants to leave a laptop behind and needs something to back up data to, it is a great option. HP(Zbook) and Lenovo(P50) laptop are made for MIL-SPEC standard. It will be interesting to know if these devices meet any existing standard like MIL-SPEC. Zbook was formerly called as Elite Book series, example: 8570w. Zbook comes with Dream color display which has 10-bit color depth. I have used both Zbook and 8570w, and they are reliable, rugged. Ramesh, there are plenty of great options for rugged laptops, you are right. However, having used a few of them in my previous job, where we had to provide rugged laptops to field engineers, I know that they can be pretty bulky and heavy. Personally, I would prefer to keep my backup workflow simple – if I don’t want to take a laptop with me, then I will resort to either taking more memory cards, or using another backup solution such as the WD My Passport series. Thank you for your work. I had read and seen a few reviews which were disparaging. When I saw your article title I was hoping that they had made great improvements. After reading your article, which was top notch, I realised that this was not so. Mark, you are most welcome! Glad you’ve found the review to be helpful. Personally, I wouldn’t recommend the Gnarbox to anyone. While it sounds great on paper, it fails to deliver on a number of levels in the field, as pointed out in the review. Thanks Nasim for the excellent and honest review. I also bought a RavPower filehub that seems to do most of what this does except backup storage gor $40. I don’t even use it anymore. Given that storage is so cheap now an extra xqd or sd card is cheaper per mb an a lightning sd card reader a better faster solution to editing pictures for social media. Actually, with dual cards and Snapbridge you really don’t need any of this. Who would buy this? Just bring your editing laptop with you. I bought one, based on a chat with GNARBOX customer service. I specifically asked if it would allow me to review and delete images directly from the memory card without having to import the whole bunch, as I would into Lightroom or an iPad (which also took forever, but it was an original and very slow iPad). She told me that I “hit the nail on the head”. As it turned out, 1) my camera (Canon 6D Mark II) is too new, so while I could apply some basic edits to an image, I couldn’t save it without it being pink (they’re working on that); 2) images are only viewable vertically on the phone, which made the viewable image smaller on the phone than it was on the camera (they have that in the future development list); and, most importantly 3) they removed the ability to delete single images directly from the memory card because people could accidentally delete the entire contents of the card, so what I specifically requested and was told was a feature, was not available. The device has a lot of potential, but it’s not there yet, so I’ll be dragging my Surface around with me for the forseeable future. On the bright side, I bought it from B&H, but GNARBOX bought it back from me directly, so kudos to them for that. I’ve ditched my laptop. I’ve switched everything to a Galaxy S3 tab (with its amazing pen/stylus) and an SSD. I saw a commercial for an apple pen the other day so i guess they are trying to get in on that game. For the most part I am in agreement with this review–I bought one and essentially found it too slow and clunky for my use, gave it to my spouse who only shoots jpg and for him it was workable. HOWEVER, you may be interested to see that they have announced version 2.0 today on Kickstarter which addresses all of the issues you bring up, and perhaps more. 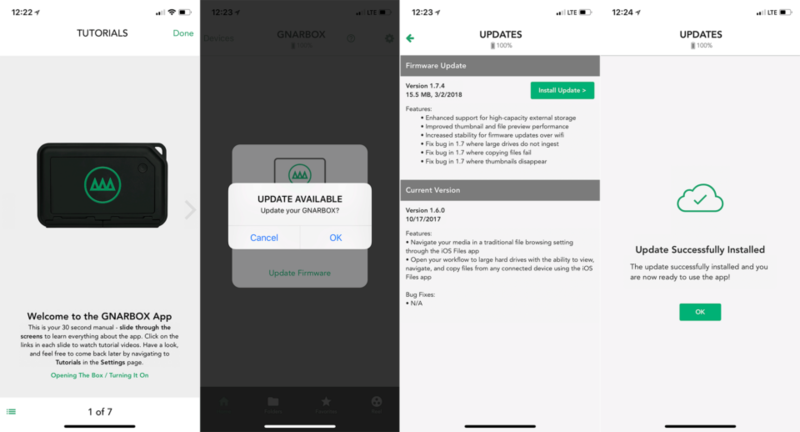 Much faster, replaceable battery, redesigned heatsink, higher capacities, one-touch backup without using your mobile device, improved apps… of course its all just promises now but the Gnarbox 2.0 looks intriguing and much improved. They just announced today and already far surpassed the Kickstarter goal. First of all I appreciate your informative article about GNARBOX. I wonder if there are other similar technology around in a cheaper & more effective devices? If so, would please review them & share them with us.